Though Dropbox, YouSendIt and other innovative cloud services that make it easy to relay files across the World Wide Web, they’re a bit inconvenient when it comes to sharing huge amounts of data. Also, if you’re hosting a university website, it’s much easier to set up a local FTP server and share some files within your network. Thus, there’s no doubt that FTP is still relevant despite the numerous other advances in the file-transfer technologies. FTP, which stands for File Transfer Protocol is a standard for exchanging program and data files across a network. The network could be the World Wide Web or simply a local area network (LAN). 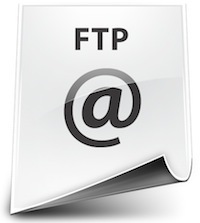 FTP Sites: An FTP site is a website that hosts files that you could download. You can access them like regular websites except for the fact that you have to use 'ftp://' instead of 'http://'. Anonymous FTP: Anonymous FTP means that you can access the files on an FTP site even if you don’t have an account on the server. Archive: An archive is the files that are made available by the server for download. FileZilla is an open-source, cross-platform FTP client for Linux. With an easy-to-use GUI and powerful features, it is undoubtedly the best FTP software available for this platform. FileZilla comes with a tabbed user interface that lets you view all the details of the files that are being transferred. Not only does the application support plain FTP, it can also handle FTP over SSL/TLS (FTPS), and SSH File Transfer Protocol (SFTP). If you’re planning to transfer large files over the network, don’t worry; FileZilla handles those things perfectly well by allowing you to resume files larger than 4GB. On the UI front, it does look a bit cluttered; however, once you get used to it, you won’t be thinking of any other FTP clients. Moreover, the drag and drop support comes in really handy for new users. For all those command-line junkies out there, LFTP is a sophisticated file transfer client. The open-source application comes with support for FTP as well as HTTP. Other interesting features include bit torrent support, SOCKS support, background jobs, bookmarks, aliases, and transfer-rate throttling. Before you start using it make sure you read the manual first. Licensed under GPL, gFTP is a free multi-threaded file transfer client for Linux and other UNIX-based computers. Written in C, the free application supports FTP, FTPS, HTTP, HTTPS, SSH, and FSP protocols. Translated in many languages, you can use gFTP as a command-line client, as well as a full-fledged GUI program. Developed in 1990, NcFTP first started as an alternative to the default ftp program in UNIX. Despite being a command-line software, it is used by many people around the world, and is, in fact, one of the most mature and stable software of this list. NcFTP runs on a large number of platforms including Windows, Mac OS X and Linux. Available in two variations, NcFTP client and NcFTP server, the free tool is licensed under clarified Artistic License. Before you get started with it, make sure you peruse first the FAQ and manuals found on their website. If you’re a KDE user, Kasablanca is the perfect tool for you. The open-source KDE client comes with features like ftps encryption, advanced bookmarking system, fxp, and drag-and-drop support. Apart from being multi-threaded, Kasablanca also features an interactive transfer queue and an advanced bookmarking system. 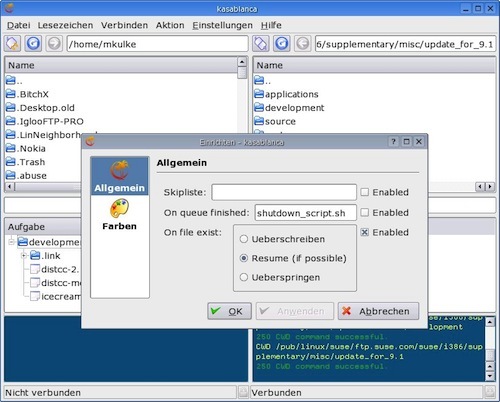 Although not as popular as FileZilla, Kasablanca is frequently used by many KDE users from around the world. Don't forget, many of the file browsers in Linux double as FTP clients. I use nautilus for one, and I know KDE's Dolphin also supports FTP. I know you don't get the fancy features that things like FileZilla support, but the integration and the convenience are definitely worth it. Midnight commander is all you need. Filezilla is really good client, especially SSL/TLS support is good bonus -- and is must.